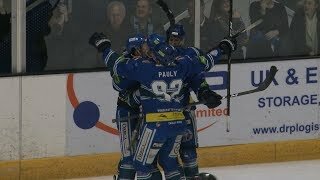 The Genting Casino Coventry Blaze began back-to-back games against Patton Conference rivals Manchester Storm with a 2-6 defeat at the Skydome Arena. 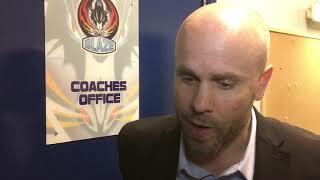 Despite being boosted by the return from injury of Canadian defenceman Justin Hache before face-off, the Blaze fell two behind in the opening twenty minutes. Dane Byers with a re-direct in front of Matt Hackett making it 0-1 on the powerplay (10.24), before Rob Linsmayer doubled the Storm lead at 12.52. A couple of seconds after Manchester going two up, from the puck-drop, Coventry local boy and Man of the Match David Clements dropped the gloves in a spirited affair with Storm’s Canadian blue-liner Riley Stadel, the two throwing wild punches before falling. It was their second fight, after the two went toe-to-toe last season when Stadel was with the Dundee Stars. Blaze’s top goal-scorer, Ben Lake pulled one back on the man advantage just 36 ticks into the middle period (20.36). The strike was his 22nd of the Elite League regular season and tenth straight game with at least a point. After Harrison Ruopp had put Manchester 1-3 up (33.47), Lake then turned provider for Tim Crowder for 2-3 (39.15), the pair both now going ten games with at least a point. Despite finding ways to come back from behind in recent weeks, it wasn’t to be for Coventry in the third as backed by Matt Ginn stopping 38 of 40 Blaze shots, the Storm hit three unanswered in the final period. Luke Moffatt (41.02), Evan Richardson (42.07) and Logan McMillan (49.35) all beating a frustrated Hackett for a final score of 2-6.